Every bride wants to look stunning on their wedding day with flawless, glowy skin, incredible makeup and gorgeous hair. But how do you achieve this and also stay true to yourself? We’ve already covered nutrition and fitness in the ‘Wedding Wellbeing’ three part feature for our Helen on Weddings (HOW) blog series, and now it’s time to talk beauty. 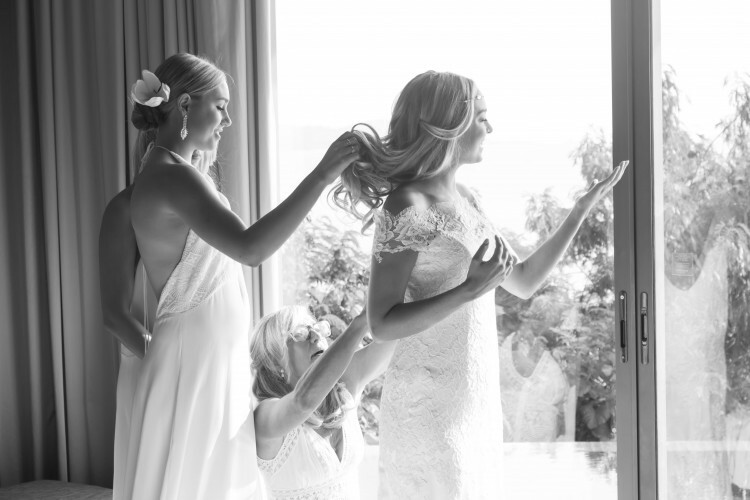 We spoke with hair and makeup expert, Jessica Berg, for her top tips for the big day. A former model herself, for the last ten years she has been helping other women all over Sydney look their most beautiful for not only weddings, but also photo shoots, editorials, fashion week, and more. So when it comes to looking good she certainly knows a thing or two. According to Jessica, it’s really important to stay true to yourself on your wedding day and not fall into the trap of wanting to overdo it or look completely different because it’s your one day to be a princess. The makeup artist gets brides to bring photos or show her pin or mood boards of the ideal look they’re trying to create, and always asks a lot of questions to make sure they get exactly what they want and aren’t thrown off by an image they see. “What that means is, often celebrities have hair extensions in and many of the images are photo shopped, to give and unrealistic expectation of a look. It's my job to explain what they are seeing in an image and what it takes to get to that point,” she says. By going through an extended hair and makeup trial though, Jessica says her brides always get the results they’re after. It’s every bride’s dream to have flawless skin on their wedding day and Jessica has a number of great tips to help reach this goal. Prepare early – Start looking after your skin at least three months out (if possible six months is better). Start on the inside – Up your water intake for hydration and add a good amount of Omega 3’s to your diet (tablets or oily fish) to help your skin maintain a healthy glow. Probiotics will also keep your gut healthy (healthy gut = healthy everything) and add an apple a day for fibre to aid digestion and keep everything flowing nicely. You can also look at a skin vitamin combination such as A, C, E which all help skin, hair and nails to look their best. Invest in a good skincare brand – Enlist the help of a beautician or makeup artist for advice on the best brand for your skin type. If you’re less than three months out from the wedding though, don’t change your skincare regime as your skin won’t have time to adjust. Get facials – Regular facials allow your skin to slowly resurface and regenerate, but go to a professional rather than trying to do them yourself at home. Jessica personally gets Glycolic peels from her beautician and finds her skin’s texture improves each time. Use sun protection – Make sure you protect your skin all over and not just on your face, because areas like the neck and décolletage also really feel the effects of too much sun. Don’t pick your face – If a pimple comes up don’t panic. Keep your hands clean and resist the urge to pop it, and if necessary see your beautician who has the knowledge on how to extract it carefully. You don’t want to risk scarring. Go the natural look – For the actual wedding day you don’t want cakey foundation. Skin should look natural, glowing, beautiful and flawless and your makeup artist should be able to help you achieve this. A bit of natural dimension can be added with highlighters. Keep hydrated – To maintain your glow throughout the day remember to drink water in between each alcoholic beverage. Your skin will love you for it and you’ll be radiating beauty all day! In Jessica’s experience, the best style of makeup that suits most brides is again a natural look with emphasis on the eyes. When it comes to hair, Jessica believes it’s best to start by looking for photos of other brides or celebrities who have the same hair colour or close to what you have. Her other key tip is to consider a second hairstyle option in case the weather is terrible on the day. For example, plan for a ‘hair down with curls’ style if that’s what you really want, but consider an ‘updo with soft curls’ option if on the day of the wedding it’s blowing a gale with torrential rain. Because sometimes a ‘hair down’ style might be really tough to achieve, no matter how much of a guru your hair stylist is. Jessica’s final advice to all brides is to relax and enjoy the process, because getting hair and makeup done is so much fun and a really important part of a bride’s day. For more information on Jessica Berg, please visit her website imagineyourself.com.au or follow her on Facebook or Instagram. Helen on Weddings: After 16 years in the bridal business fitting thousands of brides personally, Helen Rodrigues certainly knows a thing or two about weddings. Follow our Helen on Weddings (HOW) blog series as Helen and her team share their knowledge and stories to help make your big day as beautiful and memorable as possible. All brides want to look and feel their absolute best on their wedding day, but what many don’t realise is that it starts with what you’re putting into your body. Good nutrition can improve everything from your skin and hair to your mood and energy; so a healthy mind and body is what all brides should be aiming for. As the first article in our new three part ‘Wedding Wellbeing’ feature for our Helen on Weddings (HOW) blog series, we’ve gathered the top tips and tricks for you from one of the best in the business: expert nutritionist, blogger and author, Jessica Sepel. Jess herself was also a Helen Rodrigues real bride not long ago and so we’ve even included some of her own personal nutritional tips for the big day to help you out as well. According to Jessica, the assumption is that all brides are trying to lose weight, with many guides and programs all geared towards dropping weight fast in time for the wedding. “I get it. As a bride-to-be you can feel enormous pressure to look and feel perfect for the special day...but I also know that the complicated relationship with food that results from this doesn’t make you or your body good,” she says. This is something Jessica knows firsthand. Her previous unhealthy relationship with food and subsequent recovery journey is what actually prompted her to start her JSHealth blog. Letting go of this controlling and restrictive strive for thin perfection also ended up being the key to making her wedding amazing. Jessica believes that our relationship with food has a huge impact on our emotional and physical health – and the relationship with everyone around us too. Jessica believes it’s important for brides preparing for their wedding day to realise that real and everlasting beauty is from the inside out. Load up on veggies – add more greens and other vegetable to your plate as the nutrients will feed your skin and hair cells. Include protein at every meal – to help with energy levels and other functions. Eat lots of good fats – so many women are afraid of healthy fats and avoid them, but this is great for your skin and hair, so embrace and enjoy things like avocado, salmon, nuts and seeds. Take care of your digestion – more detail can be found in her book, The Healthy Life. Drink plenty of water – stay hydrated by drinking two litres of filtered water a day to achieve healthy skin and hair, flush toxins, aid digestion and generally feel better. Add supplements – such as zinc, fish oil and vitamin C.
Make time for sleep – Jessica herself has a non-negotiable commitment to eight hours of rest every single day for a healthy mind and body, and believes sleep is even more vital for brides. According to Jessica, most brides do their best to move and eat well in the weeks and months leading up to the big day, but it shouldn’t stop there. “The way you fuel your body on your wedding day is just as important as the preparation you’ve put in during the planning process. And it can be challenging – you’ll be excited, nervous and BUSY,” she says. On the big day ideally Jessica recommends brides eat clean, real whole foods – mainly fruits, lean protein and veggies – but in small amounts to avoid bloat and dehydration, and boost that bridal glow. Pre breakfast: Upon waking, sip warm water with the juice of one lemon squeezed into it along with some ginger. Both lemon and ginger are detoxifying on the liver and prepare the digestive system for the food to come. As tempting as a mimosa might be, it can cause a blood sugar spike on an empty stomach. Breakfast: For a bride who loves her java, one cup of black coffee – no milk or sugar added – is good. Too much more could cause extra jitters and there’s no time for that on your big day! Follow this with fresh papaya (which contains an amazing enzyme that soothes the digestive system) or grapefruit with a drizzle of lime juice. Lunch: A piece of grilled fresh white fish with lots of herbs and spices and small green salad, or some steamed greens drizzled with lemon juice – no salt added – are great options for a light lunch. Avoid salt to prevent fluid retention and opt for herbs and spices instead which are anti-inflammatory and natural detoxifiers. Snack: A light snack before the festivities begin is a great way to keep your blood sugar in balance – but what you nibble on is key to avoid a sugar crash. Munch on fresh celery and cucumber sticks which are natural anti-diuretics (which means they help rid the body of excess fluids). And add a small handful of raw almonds or walnuts – the healthy fats give skin an amazing glow! Dinner: For most brides this will be at the wedding. It depends on your menu of course, but lean protein with veggies will give you major energy to dance the night away with your groom. And when it comes to the wedding cake? Go for it! Bloating will no longer be an issue and you deserve to celebrate. Drinks: While loads of water is encouraged in the lead up to the wedding, it’s best to stick to small sips on the big day. This will prevent bloating and extra fluid retention, and mean fewer trips to the bathroom (great for all those brides in a more elaborate dress!). Bubbly is likely to be flowing all day, but try to only have one or two glasses after the ceremony and stay well-hydrated out on the dance floor so you can thoroughly enjoy your wedding night with your groom. 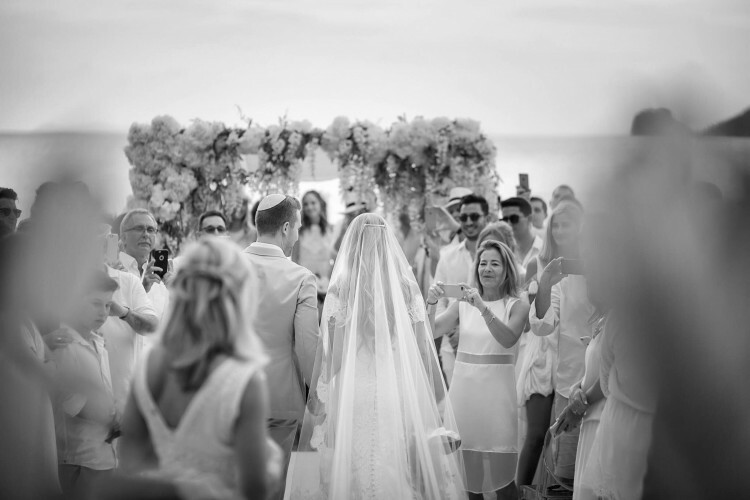 The renowned nutritionist married her love Dean back in December 2015 in Thailand on a beautiful sandy beach with 170 of their closest family and friends watching on. Jessica wore a stunning Anna Maier dress from Helen Rodrigues and their ‘healthy wedding’ retreat-like celebrations lasted four magical days. 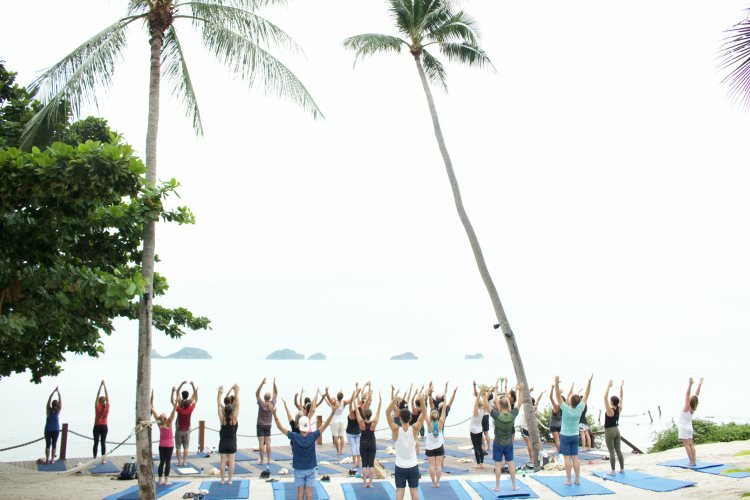 Activities and aspects of their inspiring nuptials included: healthy gift bags for guests, fresh healthy wholefood buffets and snacks, vitamin juice shots, sunrise yoga, organic wine and day spa massage and beauty treatments for the girls. Jessica also even managed a refreshing personal meditation for herself just before the ceremony – something she highly recommends for all brides on their big day. For more information on Jessica Sepel, her wedding, her JSHealth program or books, please visit her website jessicasepel.com or follow her on Facebook or Instagram.